Men’s blonde hairstyles come in all types and lengths. Some hairstyles are more often seen with specific hair colors like. 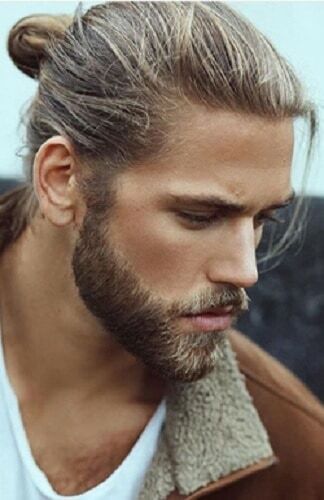 Here we will look at different men blonde hairstyles. One popular blonde hairstyle for men is short spiky style such as that worn by Justin Hartley in the television series Smallville. Brad Pitt wore a similar style in the movie Fight Club. Not all short blonde hair is spiked. In fact, some blonde hairstyles are short enough to be classed as a buzz cut and Caesar cut. However, most who wear their hair that short have darker hair so that they do not appear to be bald. Another popular blond hairstyle is the faux hawk. This style is based on the popular punk style known as the Mohawk. The primary difference is that the sides of the head are not completely shaved. Instead, the hair on the sides of the head is left short while the center stripe is allowed to grow longer and is often pulled up so that it stands out from the hair. 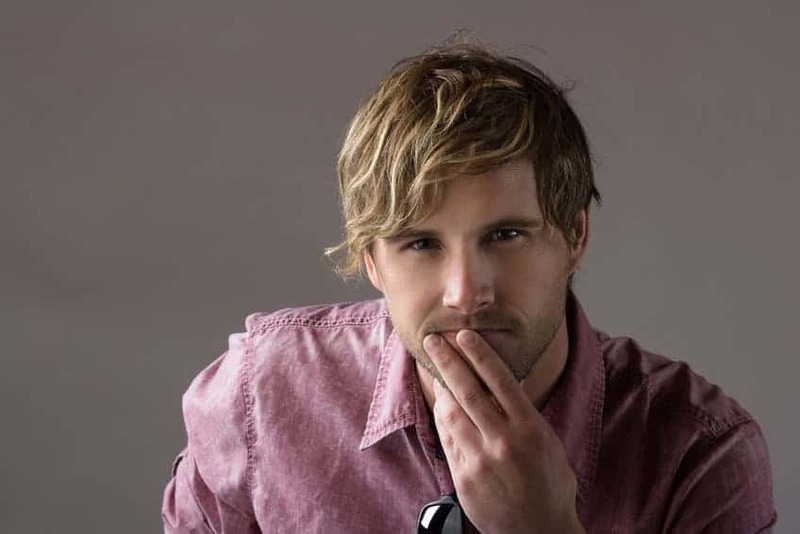 One style that is almost exclusively worn by men with blonde hair is a medium length shag worn by members of the surfer subculture. This hairstyle has a distinctive cut but can be styled in different ways. One common factor is the fringe that normally covers, at least partially, one eye. The slick back undercut style is one the most popular men’s blonde haircuts you can get. All you need to do is get the lower end trimmed and you can back brush the upper part. You can also use hair gel on the upper part and set it well. Pair it up with a smart outfit and you are good to go. This particular haircut suits men who like to keep it short and smart. You need to get it cut really short in a way that you can manage it well wherever you go. This kind of blonde hairstyle is good in the sense that it is low maintenance and stays for a long time. If you have short blonde hair, this is one cool hairstyle that you can carry when you go out with your friends or for casual outings. All you need to do is cut it short and make it messy. We suggest you not to brush it in one direction. Pair it up with loose t-shirts. You can get this haircut very easily by keeping some amount of hair long in the middle. Cut it into fringes and make sure you comb it in a way that looks natural. You need to keep the hair short on either side and the bottom line. If you have blonde hair, you can get it faded on either side. This just means get it highly trimmed from the sides. You can get fringes in the middle or get a Mohawk that stays all day. You can complement it with a trimmed beard and you will turn heads when you go out. 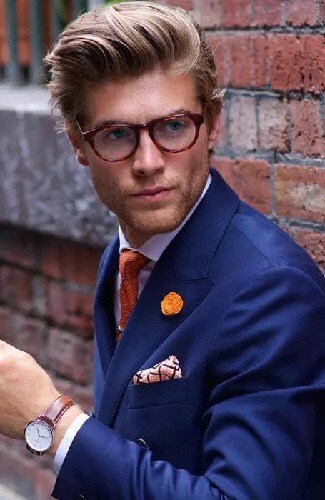 This style is for men with blonde hair who like it messy and unkempt. Get long bangs and comb it in different directions. You can get the sides of the hair cut short on either side. Get a beard and mustache along with a haircut to complete the long. This is one of the most popular men’s blonde hairstyles again. This can be done by trimming the sides and brushing the hair to make it look fluffy. It makes you look classy and smart. 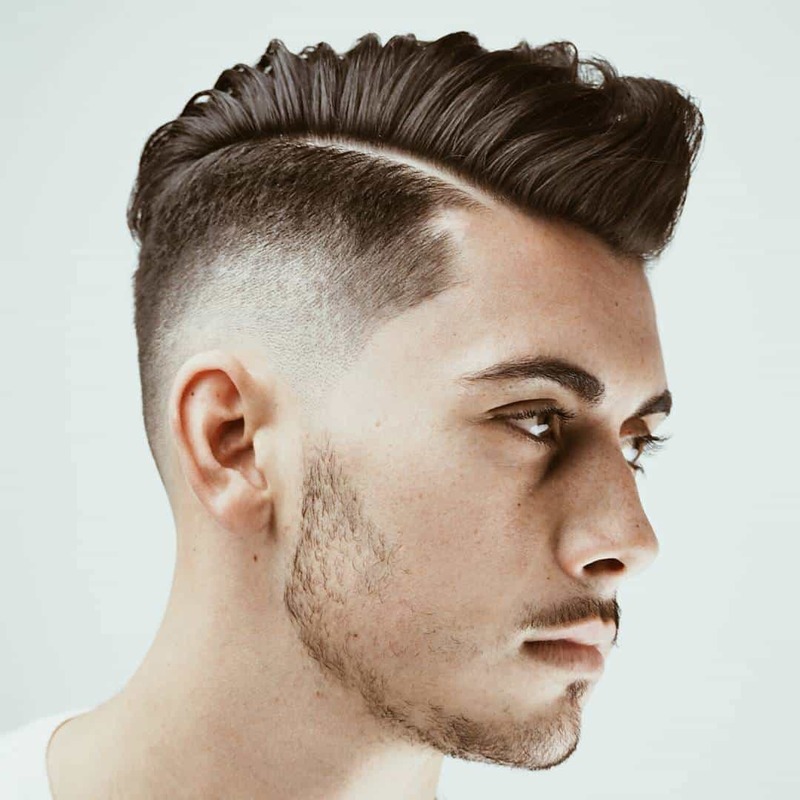 You can improvise this style by getting your hair trimmed on either side or getting patterns shaved on the sides. This spiky hairstyle can be the talk of the town if done properly. All you need to do is cut your hair short on the bottom. The middle portion can be spiked up with the help of gel. Make sure you use a good quality hair gel though. You can try highlighting the spikes with deep brown color that contrasts with your original hair color. Blonde straight hair can look very out of the place if not styled properly. What you can do is get locks and layers. This looks casual and nice. Since you already have blonde hair, you don’t need to get it colored. You can pair it up with check shirts to get a cool look. Last but not least, what better than a loose man bun tied a bit low with a rubber band. You can keep some locks and fringes outside to bring out the handsome hunk in you. 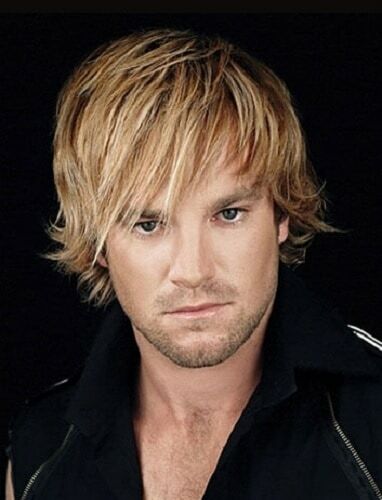 Authors, actors, and musicians are known to keep this kind of men’s blonde hairstyles quite often. Pair it up with traditional clothes and you are good to go. Some men like to let their hair grow out long. In many cases, this means simply having the hair cut in layers and wearing it with a part in the middle and the hair swept to the sides or back. Others have the hair in front and on the sides cut shorter and wear their hair in a style known as a mullet. There are many different men blonde hairstyles. Some are for short hair, some are for medium length hair, and others are for men with long blonde hair. So get the suitable blonde hair for you according to your hair length.